Fear of AI has given way to exuberant optimism/anticipation/impatience. Many vendors are trying to pivot their legacy products as next-generation AI platforms/marketplaces. Confidence in AI performance will only come with independent validation. Cloud has faded to the background. Not everything about AI is good news, adversarial attacks could bring about a new era in cyber-security concerns for providers. Over the course of the last 18 months artificial intelligence (AI) has matured to the point where there are several viable vendor options for nearly every use case. 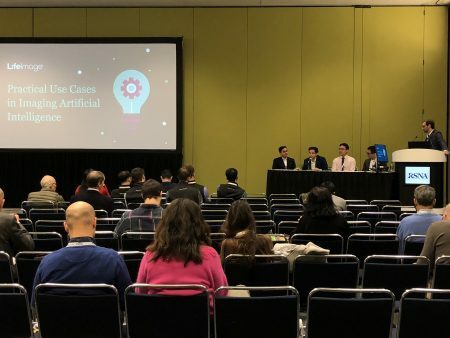 AI dominated every aspect of the annual gathering of the Radiological Society of North America (RSNA18) in Chicago. Self-described ‘machine learning’ vendors with a presence on the conference floor more than doubled from 49 in 2017 to over 100 in 2018, 25 of which were first-time presenters. Last year, the major cloud vendors each had a significant footprint at RSNA, but this year the two largest, Amazon and Microsoft, were nowhere to be found. Only Google Cloud had a significant, if smaller than last year’s, presence. Donny Cheung, one of the Google Cloud team leaders, was on the panel I moderated and his message to the imaging community could be boiled down to two words: storage and compute. No dashboards or toolkits or tensorflowing, just storage and compute, a smart and refreshing strategy amidst the obvious feature creep many other vendors suffer from. Over the course of the last 18 months artificial intelligence has matured to the point where there are several viable vendor options for nearly every use case. While it was surprising that Amazon had no noticeable presence, it was even more surprising to find Facebook making news on the conference floor. Facebook AI Research (FAIR) has partnered with the Center for Advanced Imaging Innovation and Research (CAI2R) in the Department of Radiology at NYU School of Medicine and NYU Langone Health to release the fastMRI, an open source dataset for training and testing machine learning algorithms to reconstruct MRI images. This offering is roughly equivalent to similar X-Ray and CT datasets released by NIH. Given that algorithms ALWAYS significantly outperform on all metrics against the data used to train them versus new data, the industry needs independent validation of AI claims so it is unlikely that Facebook moves the needle with this offering. International AI startups, particularly from Israel, China, and South Korea, stood out from the crowd in terms of their approach to product design, but only the companies from Israel have been able to break into the US market so far. One Korean company voiced frustration with the FDA, saying it couldn’t understand what was wrong with their application. I wonder if it underestimates the importance of using data from US patients to validate their algorithms? Not everything we learned about AI at RSNA was positive. A paper presented at the conference showed that neural networks could be used to insert malignant features into mammograms giving a false positives, and then reverse the alterations without detection. Even scarier, it took about 680 images to train the algorithm that executed the adversarial attack. Cyberattacks have been increasing in healthcare over the last couple years, but mostly just for taking data hostage and demanding ransom to get it unencrypted. This type of attack would represent a frightening new paradigm in cyber-vulnerability, and it is certainly not difficult to imagine ways this could be exploited to make money. It could be used for a different sort of ransom, with every image appearing to show cancer until a ransom is paid and the adversarial attack is reversed. Another conceivable way this type of attack could be exploited would be falsifying data for clinical trials. This post was originally published on the Chilmark Research blog.